Water pumps are designed to provide a constant circulation of coolant in engine cooling system. HOLA water pump construction includes five main elements: pump body or cover, assembled shaft and bearing with impeller, timing pulley (pulley hub) and labyrinth seal installed. Pump parts have special protective corrosion resistant coating. 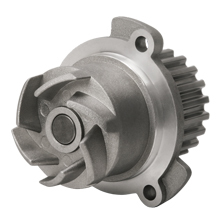 Specially designed impeller allows optimal flow and pressure created by water pump. Application of enhanced high-quality bearing provides extended operating life of product. HOLA water pumps are completed with gasket for installation on engine, and specially designed seals provide minimal friction of moving pump elements and exclude coolant leakage. Estimated operating life of HOLA™ water pumps is more than 50 000 km run*. HOLA™ water pumps are certified to meet standards of the Russian Federation.